No matter how old you are, food is something that instantly bonds and connects us as human beings. It is this very notion that is the driving force behind The Rhema Foundation Canada’s ongoing project, Generation Fusion. Generation Fusion is a series of intergenerational meet-ups that aim to bring the young and old together through food. Specifically designed for active seniors and isolated youth, the program helps to connect two vulnerable populations. Not only does the program help participants build meaningful relationships, but it also puts youth in leadership roles that allow them to dismantle harmful stereotypes. The impetus for the program largely comes from the changes in our modern lifestyles. In other words, older men and women are increasingly isolated and today’s children are less likely to interact with seniors. By brining together these two groups, Generation Fusion provides opportunities from previously isolated populations to learn from one another. 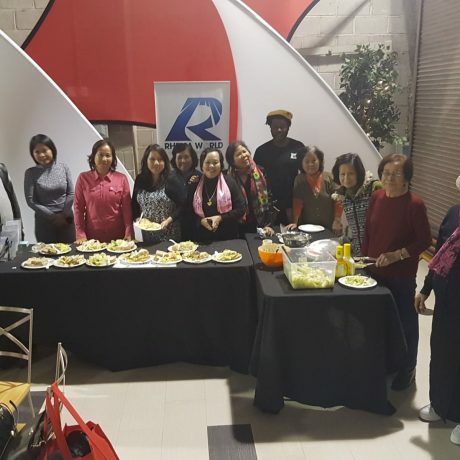 To ensure that the youth and seniors involved in Generation Fusion have the time to build lasting connections, The Rhema Foundation Canada held three lunch meet-ups in 2017, and has organized three further meet-ups for 2018. Assisting in the facilitation of these meet-ups are partner organizations The ReDesign Group, Chef T Catering and Culinary Workshop Services, Linda’s Cambodian Seniors Group, and Greater Good Mentoring Services. While a lunch date between seniors and local youth may sound like just another social activity, Generation of Fusion goes beyond a basic meal. Each meet-up involves a culturally inspired meal that helps to bridge cultural divides. To keep youth and seniors engaged, meals are also followed by hands-on activities. The longterm outcome of this project is to construct a community kitchen at Rhema. This kitchen will host ongoing meetups between seniors and the youth and keep the spirit of the program alive. While our first lunch meetup of 2018 has passed, there are still more events to come. To support Generation Fusion, please contact us.